Trucks drive the Australian economy and are a constant feature on our roads. But when a truck is currently unable to be driven for whatever reason and needs to be moved interstate or just down the road, it’s time to bring in the heavy haulage experts. If you need to have a pig dog truck, concrete agitator, light truck or even a prime mover relocated, you’ll want to find a highly experienced and specialised truck transporter to shift this heavy load. Let’s face it, heavy haulage doesn’t get much bigger than when you need a truck moved. Get quotes for truck transport today! Get 3 Quotes for transporting trucks. It’s free to request quotes. Cab Chassis Truck: If you’ve made an interstate purchase or you’ve just got a cab chassis that won’t run and you need it moved, you’re going to have to find a reliable and reputable truck transport company to relocate that for you. Heavy haulage truckies are available across Australia to move cab chassis interstate or locally through regional and metropolitan areas. Tray Truck: A tray top truck can have a smaller cab or a much larger cab and that impacts the length of the tray truck. That, in turn, has an effect on which truck transport company can be used to relocate the tray truck. If the tray truck is driveable, then loading is fairly straightforward for a truck transport company to get it onto a tilt tray flatbed or tray or if the vehicle is undriveable, then it can be winched onto the truck or trailer for delivery by the transporter. Concrete Agitator Truck: If the concrete agitator truck is driveable, then it’s a simpler operation to get it loaded onto the back of the truck’s trailer by the truck transport company. But if it’s not driveable, well that’s another story. If it has wheels that are in reasonable condition, then it should be able to be winched onto a tilt tray or up onto the trailer with loading ramps by the truck transporter but it is still a job for a heavy haulage expert. Tow Truck: A tow truck is used to carry vehicles on a daily basis but due to breakdowns or new undriveable purchases, there sometimes comes a need to find a truck transport company to shift these types of trucks as well. Whether it’s interstate or just through regional or metropolitan areas, you can find a truck transport company to carry your tow truck to wherever you need it to go. Curtainsider Truck: A curtainsider, or a tautliner, is a regular feature on Australian roads and if you’re driving in any local metropolitan suburb on any given day, you’re bound to come across one. They do require truck transportation themselves sometimes though and when they do they’ll regularly require a truck transport company with a semi-trailer for a large curtainsider. A smaller curtainsider can usually be loaded onto a standard truck’s flat tray to be relocated by a truck transport company. Garbage Compactor Truck: To load and unload a garbage compactor truck either interstate, regionally or through metropolitan areas, you’ll require a truck transporter with a tilt tray truck or trailer or a flatbed that is equipped with hydraulic or manual loading ramps. If driveable, the garbage compactor truck can be driven onto the tray or winched on in the case where the truck is undriveable by a professional truck transport company or heavy haulage specialist. Concrete Boom Truck: The concrete boom truck is an essential vehicle for many industries and simplifies jobs by reaching concrete to areas of the work site that would otherwise be a logistical nightmare. If the engine breaks down or the concrete boom truck is unroadworthy, you want to make sure it’s back and working on the job again as soon as possible. Therefore, finding a heavy haulage company able to take on a concrete boom truck becomes absolutely essential. Prime Mover Truck: A prime mover is utilised to carry a semi-trailer and as a result they are moved through all states across Australia, both interstate and locally. If you need to have a prime mover relocated and a driver isn’t an option, you’ll need to find a reliable and highly experienced truck transporter to shift the load for you so that the prime mover truck arrives in the same condition that it left in. Fuel Tanker Truck: A fuel tanker truck can range between smaller vehicles to extremely large fuel tankers and, as a result, there are a host of different types of trucks and trailers that a truck transport company can have to haul these heavy loads. This is when it becomes important to provide the truck transport company with the make and model of the tanker so they can figure out the dimensions and determine if they have the right truck or trailer to quote on the freight. Water Truck: The sizes of a water truck and trailer can vary greatly, so too does the vehicles a truck transport uses to carry them. A large water tanker with the trailer can require a truck transporter with a semi-trailer to shift the load. However, a water truck with a smaller cab can be delivered by using a standard flat top tray. You can find a reliable truck transportation service for regional, metropolitan and interstate runs. Tipper Truck: If you need a tipper truck moved anywhere across Australia, locally or interstate, then include the manufacturer, make, year and model of the truck. This helps a potential truck transport company shifting the load to understand the dimensions of the tipper truck which means you’ll receive far more accurate costs to relocate the tipper. 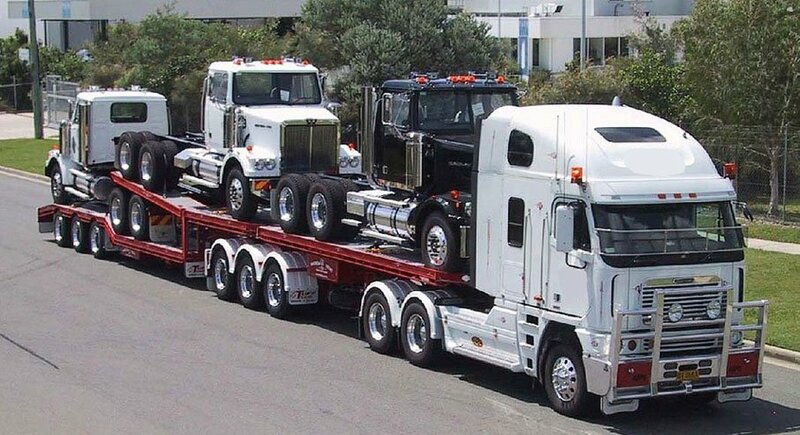 If you need to have a truck of any kind, be it a tow truck, water truck, light truck or tray truck, relocated across Australia then you’ll need to find a reliable heavy haulage expert to shift the truck for you. With FreightQuotes, we connect you with reliable truck transport companies operating throughout the country, regionally, interstate and through metropolitan areas. Simply complete the free online freight quotes form to get your truck transport costs and rates from three ABN verified truck transport companies registered with the FreightQuotes website. It’s a simple and convenient way to find truck transport quotes from carriers located within and servicing Australia. Truck transport is available Australia wide. This includes interstate, regional and metropolitan truck freight covering all states and capital cities including Adelaide, Brisbane, Perth, Darwin, Melbourne, Canberra, Hobart and Sydney. You can also find a freight quote for relocating a truck's trailer with FreightQuotes too. Heavy haulage transporters are available for any type of freight.